Samford University’s Ida Moffett School of Nursing honored outstanding students in its annual awards ceremonies. This year, awards were presented at two different events, one for undergraduate nursing students and the other for graduate nursing students. 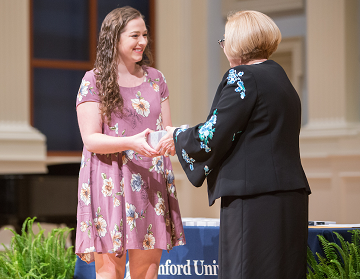 The undergraduate nursing awards ceremony was held April 20 in Brock Recital Hall on Samford’s campus. Awards presented at this ceremony included the Baptist Health Systems Awards and Baptist Health Foundation Awards, presented by Alison Scott, executive director of the Baptist Health Foundation. Individual awards and the outstanding faculty award were also presented. In addition to these, 32 graduating diplomats, honor medal and academic achievement recipients were recognized. Graduate nursing students were honored at a ceremony on May 3 in Samford’s Cooney Hall. Awards presented at this ceremony included the Baptist Health System Awards presented by Eric Jeffries, executive director of finance for Baptist Health System, and individual awards and recognition of 64 candidates for graduation with a cumulative 4.0 Grade Point Average (GPA).